Many things in life are funny, but cruelty to animals isn't one of them. When PETA recently showed me graphic photographs they fought to obtain of a taxpayer-funded brain experiment on cats occurring at the University of Wisconsin (UW)–Madison, I was sickened. The photographs show cats, some locked alone in tiny metal cages, with grotesque contraptions screwed to their heads. They also have metal coils implanted in their eyes, and some cats have been intentionally deafened. Most of us find it hard to miss a single meal, but these cats are starved for up to six days prior to experimental sessions so that they'll do anything in exchange for a bite of food. At the end of the experiment, the cats are killed and decapitated. PETA has pictures that experimenters took of this part, too. Last October, I did my part to expose this violence by recording a voicemail message for PETA that went to people all over Madison urging them to protest this cruelty. If you have the stomach for it, you can visit PETA.org/UWCats to view the same pictures I did. I think you'll immediately understand why UW-Madison fought in court to keep these photographs a secret for three years. The suffering that these cats endure is self-evident to anyone with a heart and half a brain. 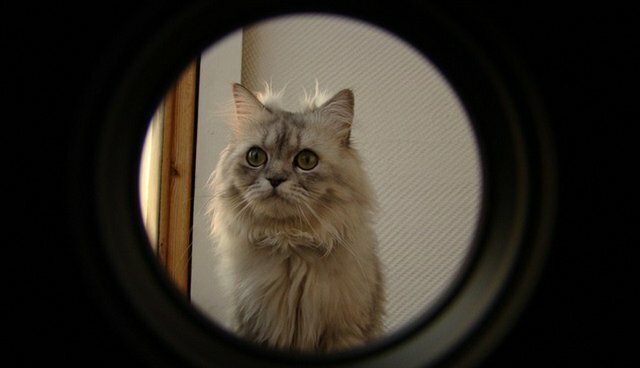 The university has pathetically defended its blatant abuse of cats in this experiment -- which nets nearly $300,000 in federal grant money every year -- by saying that it hasn't broken any laws. If this hideous experiment is legal, then that just means that our laws governing what happens to animals in laboratories are too weak -- not that cutting into cats' skulls and screwing things to their heads is appropriate or ethical. This would clearly be illegal if it happened anywhere else. Being mean to animals in laboratories isn't just stupid -- it's wrong, especially when there are better options that are actually relevant to humans, as there are in this case. But don't take my word for it. UW medical school alumni and other scientists say that the school's cat abuse is not improving human health and that the time has come to end these anachronistic experiments in favor of modern brain imaging and other ethical research with human volunteers. It strikes me that it's not the cats who need their heads examined -- it's the people who choose to go to work and purposely mutilate, deafen, starve and decapitate cats and those who fund and defend them. Season 12 of "Real Time With Bill Maher" premieres on HBO on January 17th, at 10 p.m. with guest Glenn Greenwald. To learn more about how you can ask University of Wisconsin to end cruel experiments on cats, view PETA's action alert here.